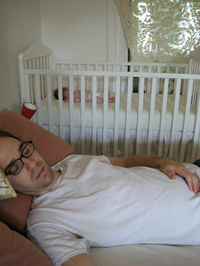 “Your baby's sleep troubles are quite possibly your fault, but no one can tell you what you're doing wrong. Sweet dreams!” writes Paul Tough, tongue-in-cheek, in last weekend’s New York Times Magazine. Getting enough sleep makes parents and children positive, open-minded and better able to cope with the challenges of daily existence. Interrupted or insufficient sleep makes parents and children cranky, accident-prone and irrational. Cumulative lack of sleep makes everything seem worse. Bad sleep patterns are hard to break. Travel, illness, visitors, new babies and other disruptions throw off good sleep patterns. Good sleep patterns are hard to re-establish. With each new study, it becomes clearer that the negative effects of bad sleep are larger than you might think and should not be ignored. Thanks, you big bunch of experts. No wonder most parents I know are obsessed. Not only does sleep rule our lives, but it’s our responsibility, we cannot fully control it, and without it our children are at some unfathomable disadvantage. Is it me or is all this just noise to add to the conversations about things like the effects of ‘educational’ TV on young children, of talking to your kids, and of omega-3s on the brain development of your fetus? I’m not saying these issues aren’t important, and I appreciate knowing why and how. But I am saying that being a sane, common-sense, available and caring parent is the ultimate goal, and when the media presents scientific findings to us (and isn’t media coverage in part responsible for the kind of studies that are funded?) some of this noise gets in the way of that ultimate goal. We as a society prefer expert advice to common sense—especially if that advice is inspired by findings that seem counter-intuitive, and particularly if it adds to the overall level of anxiety to which no one in America can possibly be quite immune. Anxiety strikes me as the most far-reaching, contagious issue that most of us face. No wonder we don’t sleep better. How much sleep do I and my kids need? What, if anything, gets in the way of that sleep? How long has our sleep been this way? How long is this pattern likely to continue? What changes, if any, can we realistically make to improve things? Beyond that, it’s not your fault. And if there’s any benefit to knowing which Ivy League our kids might have a better shot at if we could make them nap more, well, I’d be all ears except I have a pillow over my head.